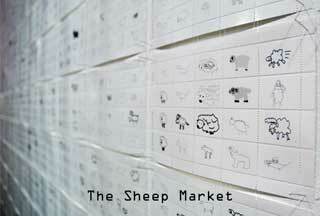 something to get through the day: the sheep market. i ponder the fate of 662 rejected sheep. >i like #7505. too cute. and faces left.i wonder if the rejected ones were facing the wrong way or were missing head and stuff. this is genius. wow i can buy them too. as stamps. that i can lick. i never seen them fancy licking stamps no more!